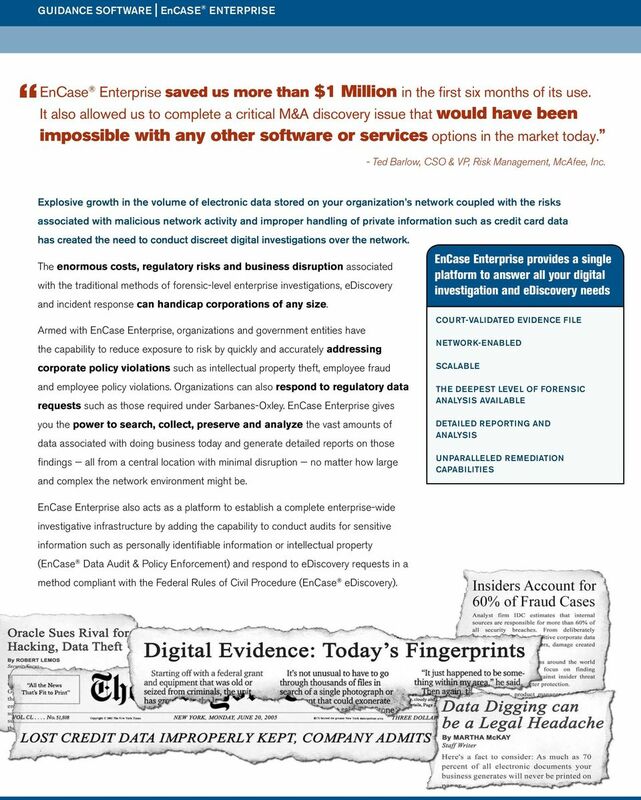 Download "EnCase Enterprise For Corporations"
3 Here are some real world examples of EnCase Enterprise in action! Case Study #1: Corporate Fraud Investigation Recovery of previously deleted documents in investigation leads to terminations and criminal charges A large multinational corporation was accused of questionable financial reporting by the Securities and Exchange Commission, resulting in an investigation by a major independent consulting company. The goal of the investigation was to determine if the CFO had ordered his staff to alter or destroy transactions to help the company s financial position appear more favorable. EnCase Enterprise was used to perform an exhaustive search of all computer records within the company s large finance division. It was soon discovered that management had ordered staff to destroy key documents. However, some employees did not fully comply with the order, making the files easy to recover. The entire process occurred covertly, without impacting business operations or productivity. Enough information was recovered to reconstruct the actual events and prove that numerous high-level managers had schemed to alter the records of the company. The suspected staff members were terminated and criminal charges were brought against them. The company was left unscathed. 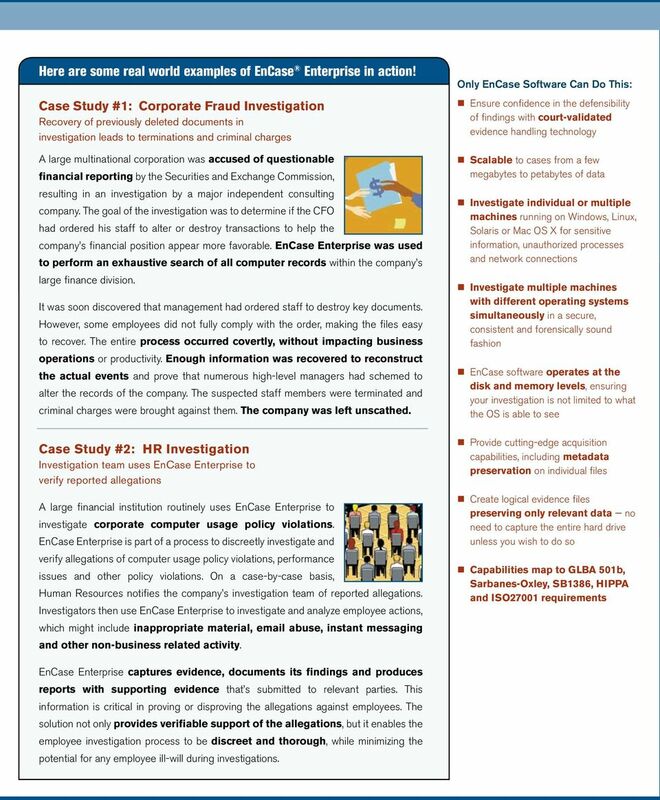 Case Study #2: HR Investigation Investigation team uses EnCase Enterprise to verify reported allegations A large financial institution routinely uses EnCase Enterprise to investigate corporate computer usage policy violations. 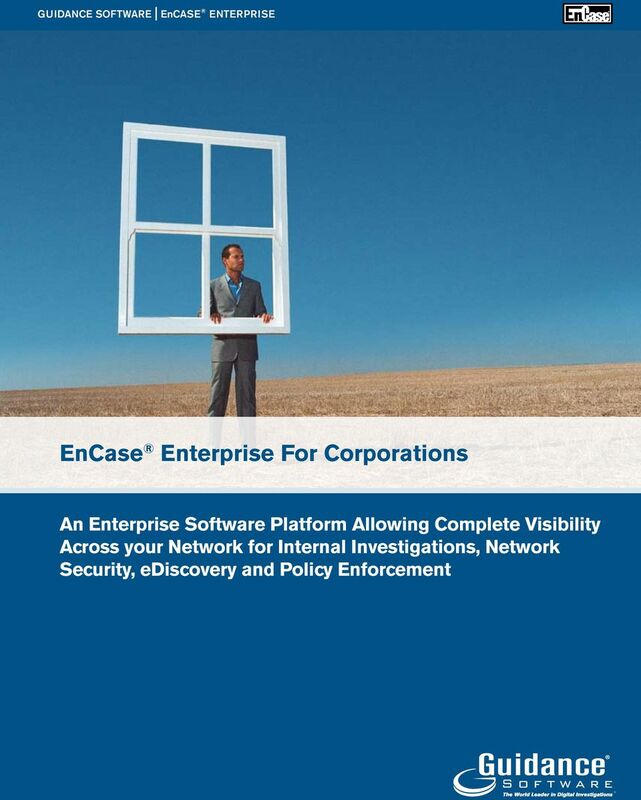 EnCase Enterprise is part of a process to discreetly investigate and verify allegations of computer usage policy violations, performance issues and other policy violations. On a case-by-case basis, Human Resources notifies the company s investigation team of reported allegations. Investigators then use EnCase Enterprise to investigate and analyze employee actions, which might include inappropriate material, abuse, instant messaging and other non-business related activity. 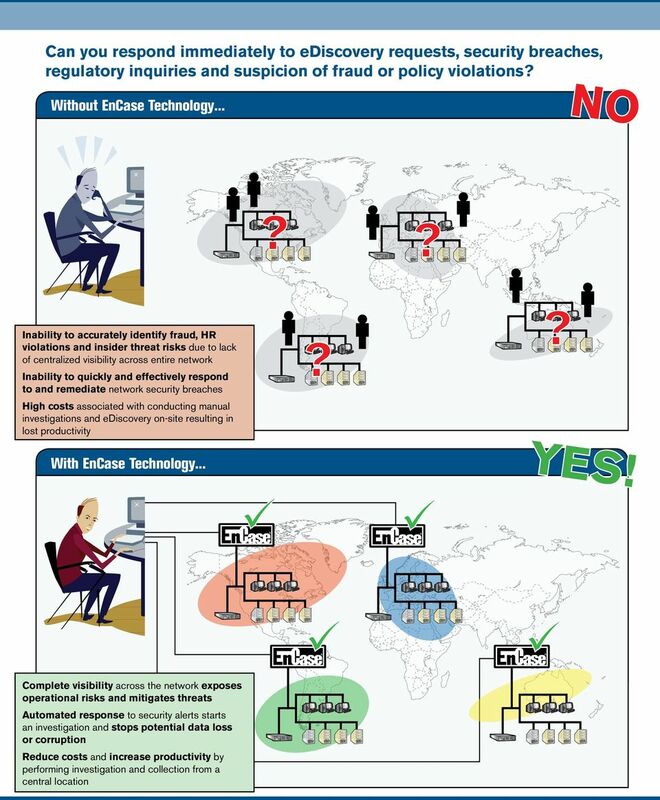 Only EnCase Software Can Do This: Ensure confidence in the defensibility of findings with court-validated evidence handling technology Scalable to cases from a few megabytes to petabytes of data Investigate individual or multiple machines running on Windows, Linux, Solaris or Mac OS X for sensitive information, unauthorized processes and network connections Investigate multiple machines with different operating systems simultaneously in a secure, consistent and forensically sound fashion EnCase software operates at the disk and memory levels, ensuring your investigation is not limited to what the OS is able to see Provide cutting-edge acquisition capabilities, including metadata preservation on individual files Create logical evidence files preserving only relevant data no need to capture the entire hard drive unless you wish to do so Capabilities map to GLBA 501b, Sarbanes-Oxley, SB1386, HIPPA and ISO27001 requirements EnCase Enterprise captures evidence, documents its findings and produces reports with supporting evidence that s submitted to relevant parties. This information is critical in proving or disproving the allegations against employees. The solution not only provides verifiable support of the allegations, but it enables the employee investigation process to be discreet and thorough, while minimizing the potential for any employee ill-will during investigations. 5 Can you respond immediately to ediscovery requests, security breaches, regulatory inquiries and suspicion of fraud or policy violations NO Without EnCase Technology... Inability to accurately identify fraud, HR violations and insider threat risks due to lack of centralized visibility across entire network Inability to quickly and effectively respond to and remediate network security breaches High costs associated with conducting manual investigations and ediscovery on-site resulting in lost productivity With EnCase Technology... Complete visibility across the network exposes operational risks and mitigates threats Automated response to security alerts starts an investigation and stops potential data loss or corruption Reduce costs and increase productivity by performing investigation and collection from a central location YE S! 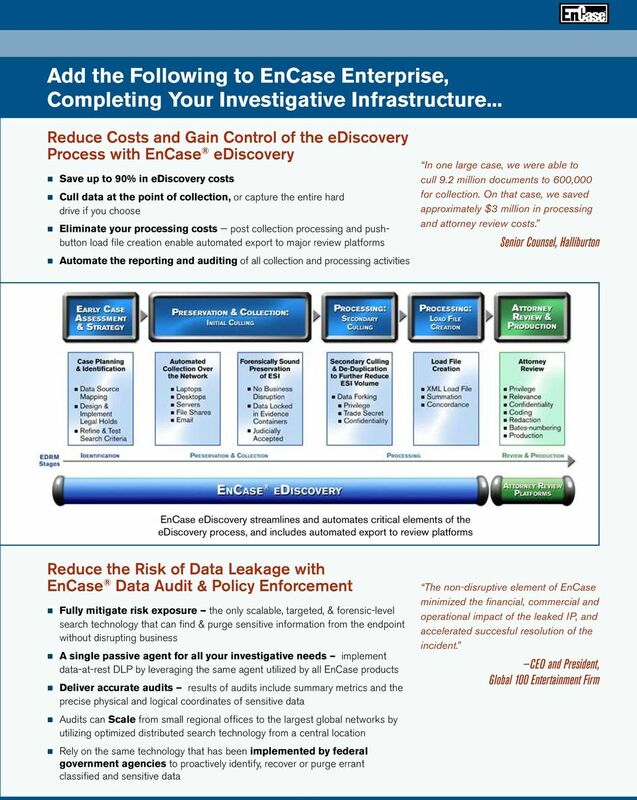 EnCase ediscovery. Automatically search, identify, collect, preserve, and process electronically stored information across the network. Network Enabled Digital Forensics. Presented by: Ben Kingston, EnCE, MCSE, A+ FDR Forensic Data Recovery Inc.
Security management solutions White paper. IBM Tivoli and Consul: Facilitating security audit and compliance for heterogeneous environments. Adopt a unified, holistic approach to a broad range of data security challenges with IBM Data Security Services. Security Incident Response Process Category: Information Security and Privacy The Commonwealth of Pennsylvania Executive Summary The Commonwealth of Pennsylvania is a trusted steward of citizen information. Best Practices in Data Protection Survey of U.S. IT & IT Security Practitioners Sponsored by McAfee Independently conducted by Ponemon Institute LLC Publication Date: October 2011 Ponemon Institute Research. THE HITACHI WAY. White Paper. 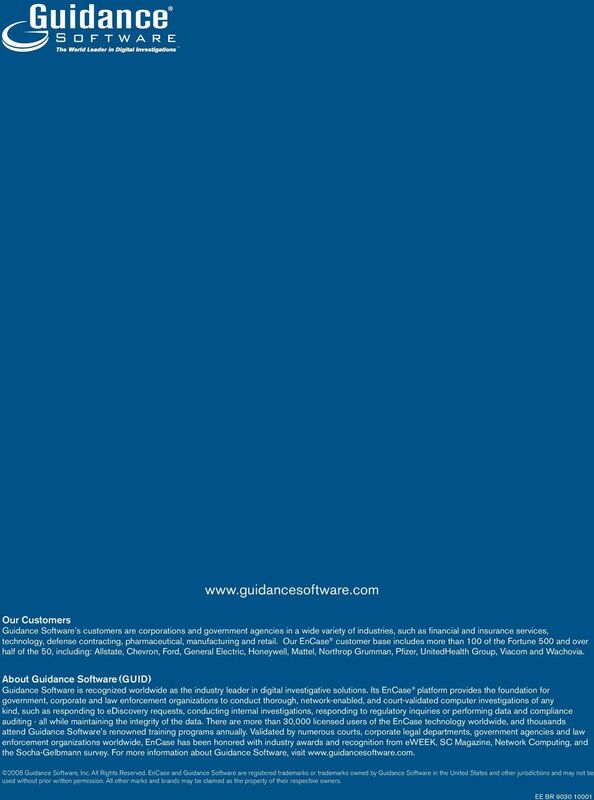 By HitachiSoft America Security Solutions Group. September, 2009 HITACHI SOFTWARE ENGINEERING AMERICA, LTD.
White Paper THE FIVE STEPS TO MANAGING THIRD-PARTY RISK By James Christiansen, VP, Information Management Executive Summary The Common Story of a Third-Party Data Breach It begins with a story in the newspaper. Top Ten Keys to Gaining Enterprise Configuration Visibility TM WHITEPAPER Regulatory compliance. Server virtualization. IT Service Management. Business Service Management. Business Continuity planning.